Germany-based machinery maker Kiefel, a member of the Brückner group, based in Siegsdorf, is expanding its production area at the parent company’s site in Freilassing, Germany, in continuing with its investments for 2018. 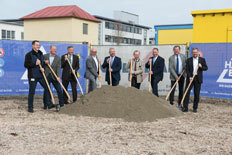 Early this year, the start of construction for the new Kiefel Education Centre took place. Kiefel says this new training hub prepares for its future growth, along with the warehouse and pre-assembly areas, which were expanded in 2017. As well, the ground-breaking ceremony for the construction of two new assembly halls took place recently. "The two new halls will house state-of-the-art air-conditioned assembly areas for the construction and commissioning of systems for the processing of plastic films covering an area of approximately 2,600 sq m. These halls are designed for maximum flexibility. For example, electricity, compressed air and cooling water are supplied through floor channels at the facilities. In addition, two 12.5 tons hall cranes combined with the height of the halls ensure trouble-free loading and unloading of the machines," said Helmut Strecha, Head of Production. This expansion will enable the planned growth over the coming years at the Freilassing location. Completion is scheduled for 2018. Despite the world market fluctuations, Kiefel says it anticipates economic growth will continue in the major markets. The order intake of the company, which is structured into the four divisions of Kiefel Packaging, Kiefel Automotive, Kiefel Medical and Kiefel Service, remains high. Due to this fact, it says it requires a modern production environment as well as additional assembly areas to render short delivery times, an important factor of competitiveness for a technology company like Kiefel. Kiefel has more than 1,000 employees worldwide, including 550 at the Freilassing location. In other news, US-based sheet extrusion machinery supplier Processing Technologies International (PTi) has opened its Technology Development Centre (TDC), a demonstration centre dedicated to product development and process trials for customers on production-scale systems. 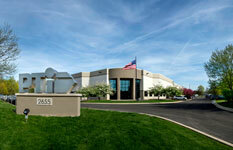 The new facility is an integral part of PTi’s recent US$10 million plant expansion at its Aurora headquarters. The company increased overall plant capacity by 50% and added 40,000 sq ft of primary manufacturing and office space and up to 40 new jobs. The firm says it has also been able incorporate this equipment into PTi University’s various training that offer PTi customers’ new employees the opportunity to familiarise themselves with operations through hands-on experience, while providing continuous education regarding the importance of safety, maintenance, and maximizing efficiency of equipment and processes for those already familiar with the extrusion processes. The 15,000-sq-ft development centre houses two demonstration sheet extrusion systems including PTi’s High Vacuum Twin-Screw Extruder (HVTSE) sheet extrusion system, featuring Italian machinery maker Bandera’s patented dryerless technology, which allows PET to be processed without the need for raw material drying and crystallising. The second line features PTi’s SUPER-G HighSPEED Extruder, a high-speed solution that delivers improved melt quality as a result of SUPER-G Lobe screw technology and is offered integrated with all of PTi’s advanced G-SERIES Configurable roll stand configurations. The multi-component features of blending, silicone coating, and winding (multiple-up), along with high outputs ranging from 2300pph (HVTSE dryer-less system) to 3000pph (HighSPEED), means that this production scale machinery allows trials and training to be conducted at typical production rates. PTi says it has already hosted numerous customers for demonstration trials and has held several training sessions. Having experienced strong growth in the packaging, industrial, and automotive industries, PTi has established itself in dryer-less PET systems in North America. The company notes that customers are retiring older equipment for higher-capacity efficient systems. Other positive macro-economic factors include capital equipment purchase incentives, low interest rates, and accelerated depreciation benefits based on the sweeping new changes in the US tax code.